DAGUPAN CITY, PHIILIPPINES–Filipino-Americans under the banner of BAYAN-USA, a US-wide alliance of 14 Filipino organizations, have been actively responding to the needs of the victims of typhoons Ketsana (Ondoy) and Parma (Pepeng) that slammed through the Philippines in the past few weeks killing hundreds and devastating thousands. In addition to conducting on-the-ground emergency relief operations in the Philippines, the alliance reached its projected goal of $15,000 for BALSA (Bayanihan Alay Para Sa Sambayanan), a broad, multi-sectoral disaster relief organization affiliated with its mother alliance, BAYAN Philippines, in addition to gathering dozens of boxes across the US filled with in-kind donations of clothes, food, and medicine. This week, members of BAYAN-USA traveled to the Philippines to deliver their monetary donations and participate in relief operations. In Dagupan City, Pangasinan, BAYAN-USA joined Congresswoman and Senatorial Candidate Liza Maza of the Gabriela Women’s Party and MAKABAYAN Coalition for one day in handing out over 2,000 sacks of food to long lines of families who had been devastated by the typhoon’s destructive force, but met with the inadequate response of the Philippine government in providing relief. Pangansinan, one of the most impacted provinces in the nation, was 80% submerged due to the man-made disaster of the San Roque Dam opening that unleashed more than 8 million cubic meters of water. In relaying its monetary and in-kind donations, BAYAN-USA expressed distrust over the Arroyo government’s recent directive for all donations from abroad to be coursed only through accredited organizations with the Department of Social Welfare and Development (DSWD) or face taxation and other types of penalties and fees. Furthermore, Philippine Consular offices in the U.S. have imposed restrictions on courier services from shipping relief goods collected by organizations whose efforts are not affiliated with the Philippine government. Courier services face high penalty fees should they choose to ship goods from people’s organizations collecting donations such as BAYAN-USA. Like other donors from the U.S., BAYAN-USA is calling for the Arroyo government to lift restrictions on goodwill, including the DSWD accreditation requirement and the taxation on relief goods, as it is posing a concrete obstacle to donors to send relief to the Philippines. With the approaching super-typhoon Lupit expected to hit the Philippines within the next few days, the need for long-term or permanent disaster relief efforts becomes more apparent. “In the face of government corruption and inutility, people’s organizations should develop long-term relief operations to meet the escalating needs of the people to fight off the looming threats of cholera, dengue and other health epidemics as well as widespread hunger and homelessness,” ended Ellorin. For more information on how to donate through BAYAN USA, visit www.bayanusa.org. 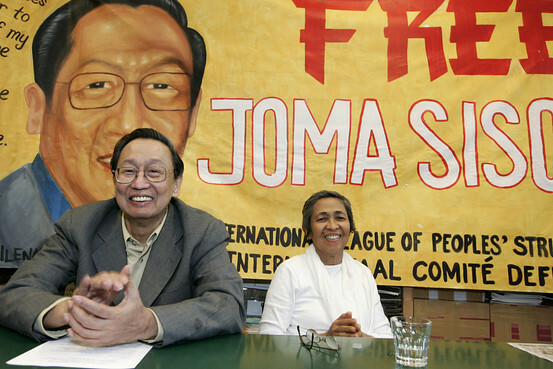 The EU’s terrorist blacklisting of Professor Sison in 2002 and the Dutch government’s subsequent arrest and detention of Sison in 2007 drew immediate criticism; well-respected organizations and individuals internationally denounced the actions as instigated by the Philippine and U.S. governments to silence dissent, particularly since the U.S. State Department had placed Professor Sison on its “terrorist list” earlier in 2002. Warrantless arrests and levying of false criminal charges against political activists are among the skyrocketing numbers of human rights violations committed since 2001 under the administration of Philippine President Gloria Macapagal Arroyo and her military. Earlier this year, Professor Sison was cleared of the Dutch government’s charges due to lack of any credible evidence. “Rep. Alcover is only deceiving himself if he thinks that anyone is going to believe his malicious lies and slanderous statements. He should apologize to the Filipino people for wasting their money and time, and issue an immediate retraction of his slanderous statements,” remarked BAYAN-USA Chair Berna Ellorin, in reaction to Representative Pastor Alcover Jr.’s privilege speech to the Philippine House of Representatives on August 17, 2009. The US Chapter of Bagong Alyansang Makabayan, or BAYAN-USA, denounced Rep. Alcover’s privilege speech as another pathetic attempt by the Arroyo regime to wash its hands of responsibility for the thousands of state-sponsored human rights violations plaguing the Philippines and to discredit the testimony of torture victim Melissa Roxas. “Melissa Roxas’ strong credibility as a victim of torture, backed unanimously by the Commission on Human Rights in the Philippines, has created a diplomatic nightmare for the Arroyo government. Roxas’ brave pursuit of justice and accountability is expectedly bringing out the witch-hunters in the Arroyo government, namely ANAD Partylist Representative Jun Alcover,” stated Ellorin. “Alcover is abusing his position in the legislature to advance the Philippine military’s agenda within. His red-baiting and inflammatory remarks also serve to undermine the resumption of peace talks between the Philippine government and the NDF, even though the NDF has every right to assert its platform for genuine national freedom and democracy, lasting peace, and a progressive Philippines. Rep. Alcover should spend his time, and the Filipino people’s money, concerning himself with public service for a nation in grave need, and not with bloody, ineffective counter-insurgency tactics.” ended Ellorin. Los Angeles–“US workers and labor unions should raise their voices against the gross human rights violations inflicted on their fellow workers, labor unions and other sectors in the Philippines,” appealed Elmer “Ka Bong” Labog, the chairperson of Kilusang Mayo Uno (KMU) or May 1st Movement, the largest labor center in the Philippines. He spoke at the UCLA Labor Center on December 4 among a number of people from diverse ethnicities. Labog was a hotel worker organizer before getting elected as Chairperson of KMU, as Vice President of the Bagong Alyansang Makabayan or BAYAN (New Patriotic Alliance) and as Second Deputy General Secretary of the International League of Peoples’ Struggles (ILPS). Labog’s history-making tour marks the first time that a leader from KMU has been allowed to enter the United States since it was founded in 1980. Over the years, large unions in the US invited past leaders of the KMU to no avail. The steadfast militant character of the KMU is the reason why. 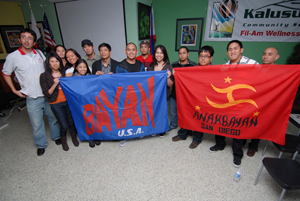 BAYAN USA, an alliance of twelve Filipino social justice organizations in the United States, helped organize Labog’s three-week tour, in partnership with the Institute of East Asian Studies at the University of California at Berkeley. He made speaking engagements in San Francisco, Seattle, Vancouver in Canada, Los Angeles, Tijuana in Mexico, and San Diego. 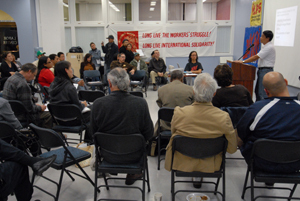 “Linking Human Rights and Workers’ Struggles Around the World,” was the theme of Labog’s talks in Southern California. It was a rare opportunity where Filipino Americans heard first-hand from an esteemed labor leader about the widespread human rights abuses and labor repression in the Philippines and their connection to the US tax dollars. Labog said, “the US military aid to the Philippines, which is the biggest in Asia, is continuing to help the repressive Arroyo regime in quelling dissent to its oppressive and anti-people policies.” Since the ascension of Gloria Macapagal-Arroyo into power in 2001, there had been 22 KMU members killed, and three enforced disappearances. Recently, labor lawyer Remigio Saladero, chief legal counsel of KMU and Board Chairperson of the Pro-Labor Legal Assistance was arrested on false charges of murder. 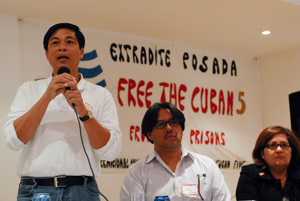 Saladero’s baseless detention affects countless other victims of human rights abuses, as he was handling nearly 700 labor cases before various tribunals. Saladero is one of the 72 people in Southern Luzon targeted to be arrested and jailed because of trumped-up accusations. These workers murders, enforced disappearances and illegal arrests are part of the unbridled human rights abuses of the government of Arroyo. To date, there are now more than a thousand extra-judicial killings, and 199 disappearances, scores are being jailed on false charges, and thousands of people in the provinces are becoming internal refugees. The KMU, and its Chairperson Elmer Labog are no strangers to repression by the US-backed Philippine government. Countless leaders of KMU, such Felixberto Olalia and Crispin Beltran, were jailed for staunchly defending workers’ rights. Labog was also jailed during the martial law regime of Ferdinand Marcos. Labog also extended an invitation to the 25th anniversary of the International Solidarity Affair (ISA) taking place in the Philippines from April 29 to May 10, 2009. The ISA is an opportunity for labor organizers from all over the world to share the struggles in their respective countries and to network and build solidarity.